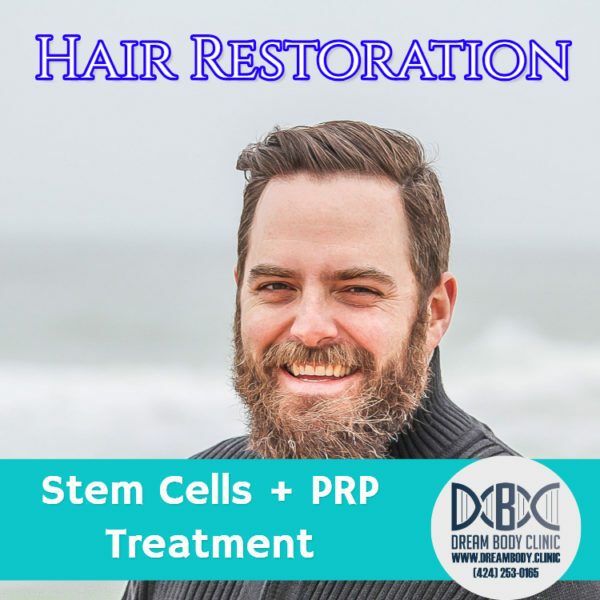 Stem Cell Hair Restoration - Get Your Hair Back Today! Stem Cell Hair Restoration procedures are now available at Dreambody Clinic! The hair restoration process consists of platelette rich plasma infused with 10 million mesenchymal stem cells that are specially formulated for esthetic procedures such as this. To be clear right up front this procedure only works if your hair folicles are not completely dead. Contact us at info@dreambodyclinic.net or call (424) 253-0165 for easy ways to find out if your hair folicles are alive. Why do we need Mesenchymal Stem Cells for hair growth? We need more stem cells as we age, but our body is using them up. When we are infants, we have the most stem cells that we will ever have and then by the time we grow up to bone maturity, we only have 10% of these cells left. Only 10% and that is all we have left to work with for the rest of our lives. Cells die off as we age and that percentage goes down even further every year. Your hair folicles are greatly effected by fewer stem cells in your system. The earlier you can get Stem Cell Hair Restoration the better. So How do Mesenchymal Stem Cells Work for Hair Restoration? Mesenchymal Stem cells work at Stem Cell Hair Restoration by stimulating the body to regenerate itself. Their magic is not in their ability to become or replace different tissues or cells, but in their production of trophic factors, bioactive molecules produced in response to the environment in which the cells are in. These secreted chemicals aid in repairing tissue and the recruitment of new blood vessels to support nutrient flow to the area and decrease inflammation. By repairing tissue, recruiting new blood vessels and increased nutrient flow your body will start to behave the way it did in your early 20’s. This means hair like a 20 year old. So it is not the cells themselves that work the magic. It is what the cells secrete that has such anti-aging and medicinal potential. Your body is amazing at regenerating and it wants to grow hair. 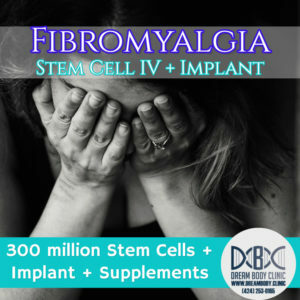 The problem is that damage and scarring occur at the folicle when the immune system doesn’t work exactly like it should from a lack of stem cells. So we get these stem cells into your folicles and they allow the T Cells to protect the area of inflammation, but without attacking the area. The mesenchymal stem cells secretions influence the immune system to eliminate some of the scarring which then allows the folicle to grow again. Mesenchymal Stem cells (MSCs) secrete a wide range of cellular products, molecules, exosomes (part of the genome thats inside RNA. Progams protein coding) and microvesicles ( Microvesicles play a role in intercellular communication and can transport mRNA, miRNA, and proteins between cells.) That act in different ways to stimulate the body’s healing process. 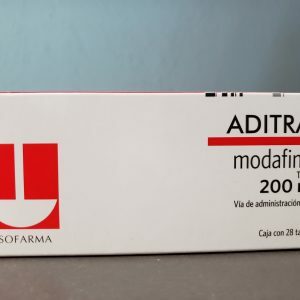 Growth factors (A growth factor is a naturally occurring substance capable of stimulating cellular growth, proliferation, healing, and cellular differentiation. Usually it is a protein or a steroid hormone. Growth factors are important for regulating a variety of cellular processes. This is why we add platelette rich plasma (PRP). The PRP adds your bodies own growth factors to the area in high concentrations. Cytokines (Cytokines are a broad and loose category of small proteins that are important in cell signaling. Their release has an effect on the behavior of cells around them. It can be said that cytokines are involved in autocrine signaling, paracrine signalingand endocrine signaling as immunomodulating agents.) 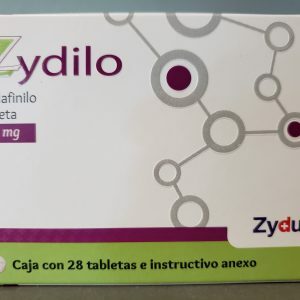 , hormones, and cellular mitochondria and RNA are among the secreted bioactive molecules and cellular material that characterize the wide range of activities carried out by mesenchymal stem cells. When considering that the main function of stem cells lies in their secretome. This is the bioactive molecules they secrete. This means they don’t have the ability to differentiate into new tissue, but instead allow your own body to heal itself properly. Isolating these trophic factors separate from the cells offers an intriguing mode of treatment. Most Patients will start to see hair growth a month after the procedure and will continue to see more hair sprout up for up to 4 months after the stem cell hair restoration treatment. Do the Mesenchymal Stem Cell Treatment Results Last? The results from Stem Cell Hair Restoration Treatment are lasting because your body is able to heal itself like when you were younger. That healing does not go away fast, just think of how many years it took to get you where you are. We do suggest that you look into our Anti-Aging Stem Cell protocol for continued care. Your body will slow down again and the stem cells in your system are not going to increase in number. The Anti-Aging Stem Cell Treatment is an IV of 100 million stem cells plus a 45 million cell implant. This done on a yearly basis will ensure that you have plenty of stem cells and your new hair will stay. The first day you arrive is to settle in and rest. You fast that night and next morning until we do a blood panel around 8 or 9am. You will have to fast until we get the blood panel results back or book enough time in Puerto Vallarta to wait until the next morning. This is because we have to take 10ml of blood to be spun up for PRP and that must be done on an empty stomach. We also need to know what medications you are on as some medications need to be stopped for a few days leading up to this treatment. We need at least 3 day notice to have treatment ready for you as the cells are only viable for 4 days from when we receive them. The doctor mixes the PRP, numbing agent and the stem cells into an insulin syringe. There is no scarring from this procedure which is unlike FUE hair transplants that can take up to a year to look natural because of the scalp scarring. We work with the lab, Cryovida (www.cryovida.com.mx) They have been a certified lab for culturing placenta and umbilical tissue for 15 years and specializing in Mesenchymal Stem Cell research. Cryovida has supplied the stem cells for thousands of stem cells procedures to many doctors and clinics around Mexico. 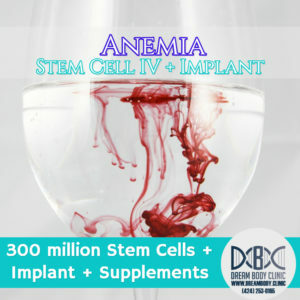 They have done a maximum of 1 billion stem cells via IV + 45 million implant for patients with no negative side effects. See Stem Cell Certification by Clicking Here. HGH + Stem Cell Hair Restoration = Next Level Hair Restoration! The stem cells act like the foreman on a construction site by directing the immune cells to areas of inflammation. They then coordinate everything to avoid scarring and repair tissue. 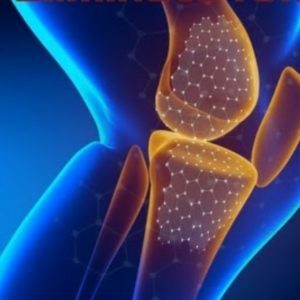 Your body is amazing at healing itself, it just needs these stem cells to direct traffic. The HGH converts to IGF-1 which is used to repair tissue. With the stem cells directing repair and giving the IGF-1 a clear path to fix things you heal in record time. HGH is well known for aiding in hair restoration and even recoloration. We have had many HGH clients report that their gray hair changed back to brown or black.